Now, if you’re Facebook with 1.3 billion active users – there’s no surprise that a redesign can impact so many people and figures. 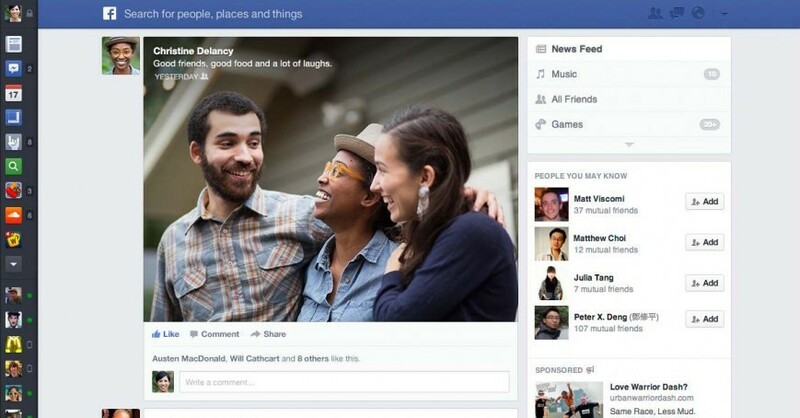 Sometime in 2013, Facebook proposed a different UI for its 2014 redesign. The layout, featured below, was called Newsfeed and contributed to an all-over new experience for the site. The content heavily focused on photos and news articles. It felt gorgeous for those who signed up on it’s wait list. As designers, there are a million things we can say about the formerly proposed layout and how it features and handles its content but at the end, it’s user experience that trumps everything. Here’s what we learned: the design we tested a year ago wasn’t better for the majority of people. At the heart of developing any product is the question of what defines better? Facebook’s current design is pretty far from the proposal and still feels like achingly familiar Facebook, but with improved accessibility and the thankful removal of the footer (endless scrolling + footer = a terrible combination!) – it also has more white space and an over all better flow then the former layout. This is about designing something that works for the hundreds of millions of people who use the Facebook website every day, from all over the world, on all types of computers. What’s design that doesn’t take experience into consideration, after all? What are your thoughts on the new design? Let us know your by leaving a comment below. You can also hit us up on our Facebook, Twitter and Google+ profiles. Lastly, our RSS Feeds is open for subscription, so that you can stay creative.